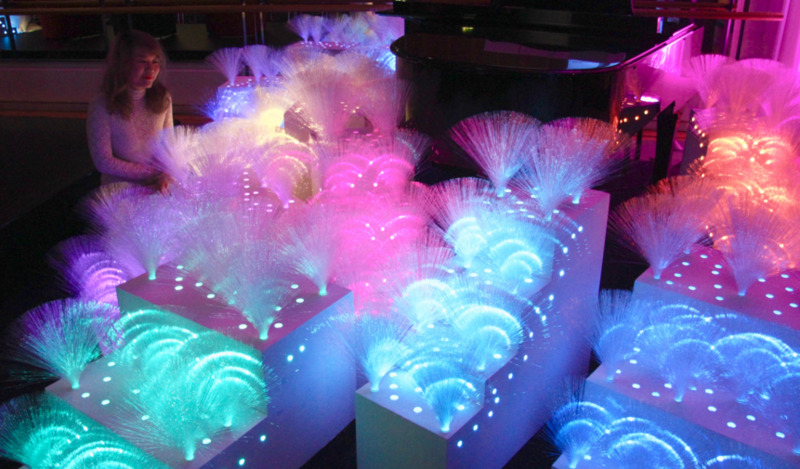 A field of interactive fiber optic lights in rainbow hues has taken over the streets of Birmingham in the UK. 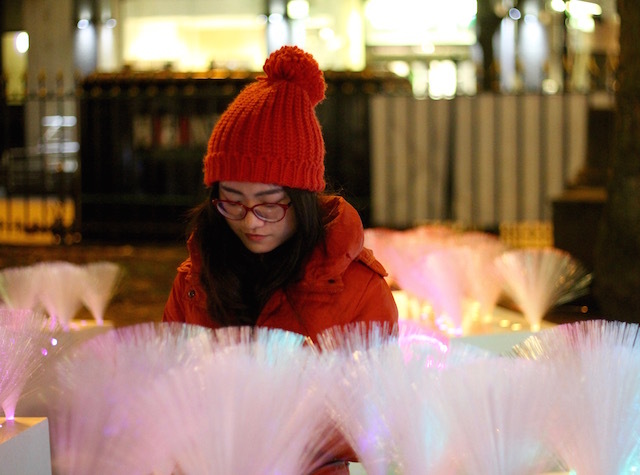 The light installation, Midlight, is the brainchild of the British-Chinese artist Aowen Jin, as commissioned by Birmingham Hippodrome CREATIVE to create a public theater experience. What’s on display here is innovation and participation as Midlight contains thousands of lights, each with 9,000 color variations that can be intelligently adjusted to surrounding sounds. This ensures that no two experiences are the same—using a proprietary beat-learning code Jin developed, each module refreshes every 10 seconds and downloads a new source code for itself every few minutes so that each viewer has a unique interactive experience of sound and color. The whole installation is also programmed to be reactive to Twitter, with each module using built-in Wi-Fi from a cloud-based server dedicated to Midlight. 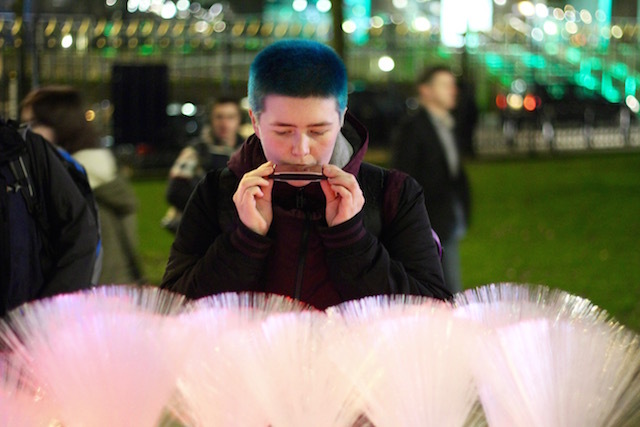 This server constantly monitors social mentions on Twitter, interpreting instructions such as “@himidlight turn red” which gives participants the power to change a whole field of colored lights through social media interaction. 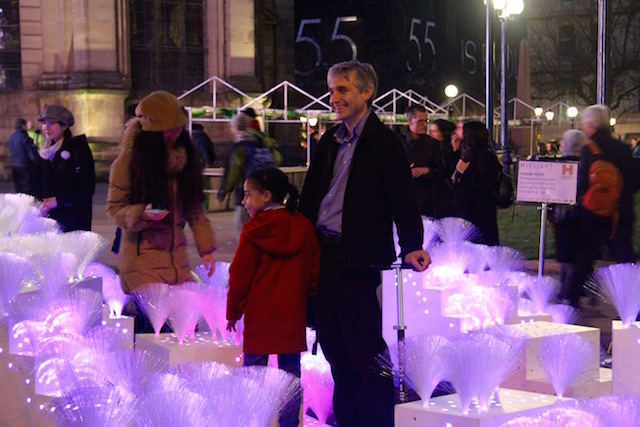 As a public art installation produced to create important community building moments and integration into a city space, Midlight is successful at being immediately enjoyable. Who doesn’t like rainbows you can sing to and whose glowing colors change per your every move, tune, or Tweet? Click here to learn more about Midlight, and here to visit the artist’s website.